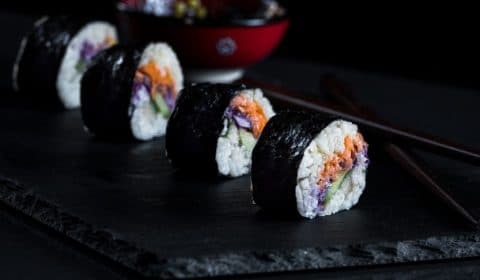 This sushi recipe is vegan-friendly and very fun to make. And it’s filled with an amazing carrot and purple cabbage slaw. Super fresh and super vibrant, give it a go! Oh boy, I don’t know what I would do without sushi. And I don’t know why. Perhaps it’s the freshness or the artistry of it? What I do know is that it’s a great recipe so let’s get into it. Sushi rice is very simple to prepare. The ratios for cooking the rice is 1 part rice to 1½ parts water. Just remember to give the rice a good rinse to get rid of that starch. 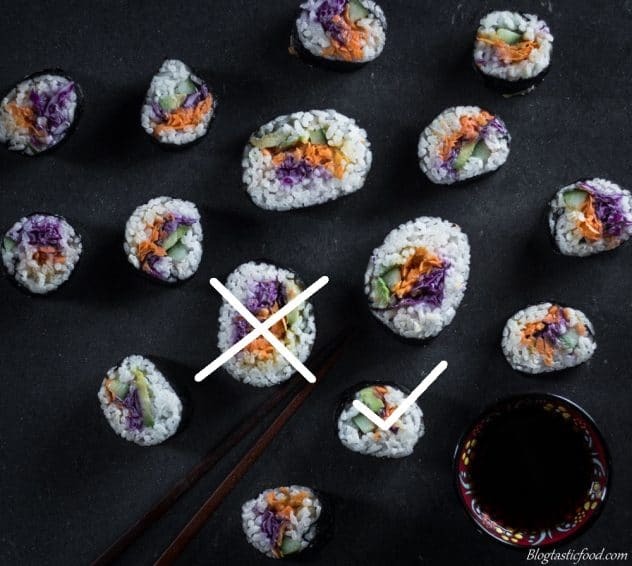 You won’t have nice, fresh sushi if your rice is starchy. The other thing I wanted to point out is that the sushi seasoning has quite a strong flavour and aroma. So when you add it to your cooked rice, it may seem like you’ve added too much. Don’t worry, once the rice cools down the strength of the seasoning will mellow and will be much more subtle. Vegan Mayo, yay or nay? I made vegan mayonnaise for the carrot and purple cabbage slaw. So is it as good as regular mayo? It’s hard to tell if it is better because there is only a slight difference in flavour. The texture is pretty much the same. Just make sure you whisk that soy milk on high speed and gradually add the oil so that your mayo doesn’t split. And don’t be afraid to jazz it up a bit. You can add chimichurri, hot sauce, teriyaki marinade etc. Whatever you want!! This is the most important part. I had previously rolled sushi only 2-3 other times and that was a while ago, so I made some mistakes the first couple of rolls. The first mistake a made was filling up the sushi way too much. 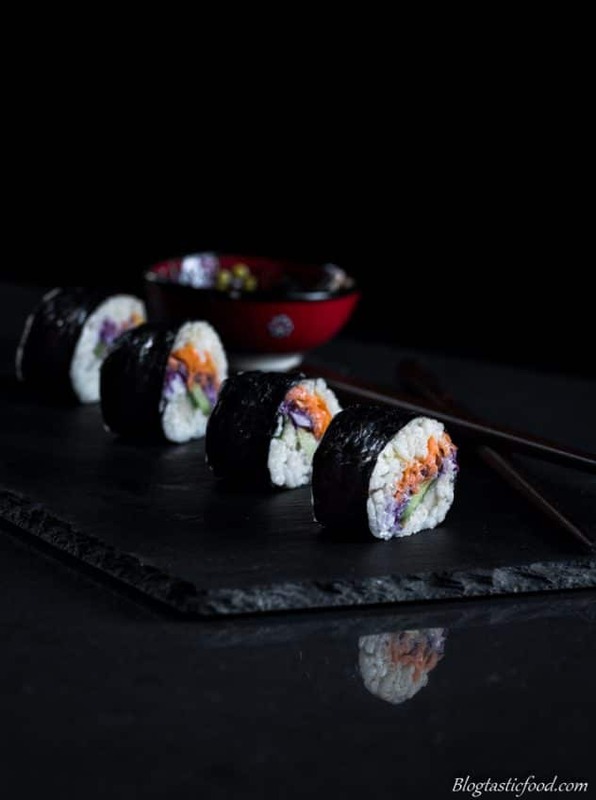 Look at the picture below, the big ones may look nice, but when I rolled them, I realised that the filling almost didn’t fit in the nori sheet, and it was very loosely rolled and could have fallen apart at any moment. The smaller ones are the sushi you want to go for. There is a much thinner line of filling that allows for plenty of space when it comes to rolling. And it was much easier to roll the sushi nice and firmly so it wouldn’t fall apart. Remember to take it slowly and carefully when you roll your sushi, and keep an eye on what you are doing. And rather than trying to be perfect, just focus on trying to make each roll better than the last. 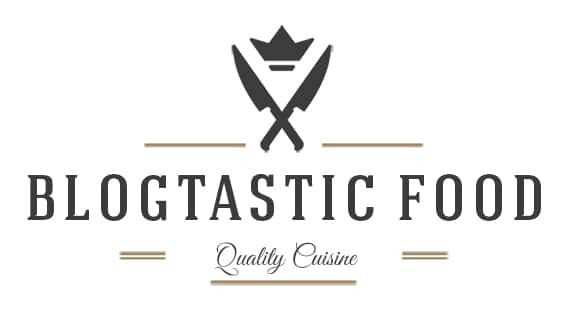 Feel free to subscribe so you can stay updated with new recipes. And if you liked this post, share it on social media or comment your thoughts down below. Oh, and if you want more on sushi, check out this Seared Sushi Nigiri post. Have an awesome day! Love you guys. Fresh, vibrant and a dang good tasting veggie sushi rolls. Put your rice in a sieve or colander, then rinse the rice under cold running water for about half a minute just to get rid of some of the starch, then transfer to a pot. Next add 2¼ cups of water to the pot, bring to the boil, once it's boiling turn the heat down, cover with a lid and gently simmer for 20 minutes. Once the rice is done, transfer to a plate or platter (something you can spread the rice out onto). 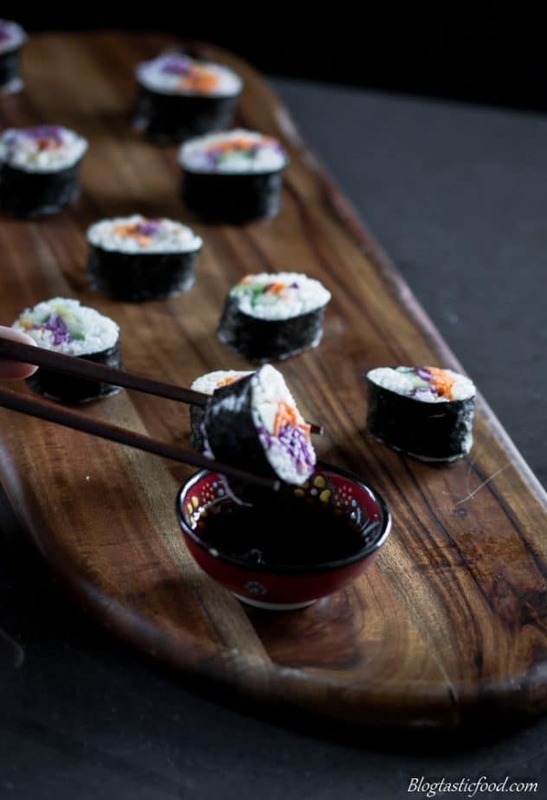 Add your sushi vinegar and stir through, then leave the rice for about an hour to cool down to room temperature. Do not put in the fridge as that can wreck the structure of the rice. Meanwhile, set up an electric beater. Put your soy milk and Dijon mustard in a large bowl, and then mix to combine. Start beating with the electric beater and slowly add your vegetable oil as your beat (do not add the vegetable oil too quickly). Once all of the oil is added and the mixture has thickened, add your rice wine vinegar and season to taste with salt. Peel and grate your carrot/s. 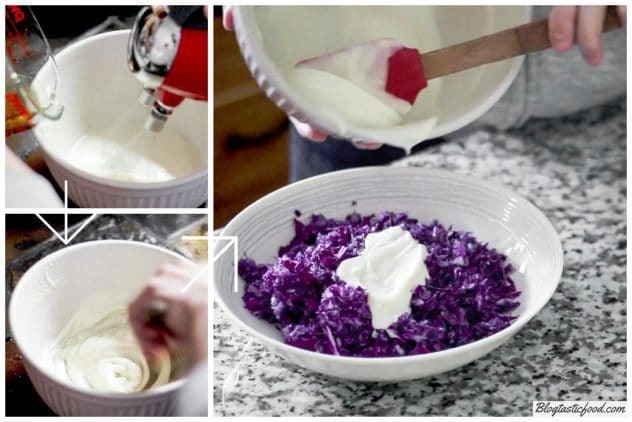 Then mix half of your vegan mayo with the purple cabbage and the other half with the grated carrot. De-stone your avocado and remove the skin. Slice the avocado quite thin, then squeeze some lemon juice over it to stop it from going brown. Get all of your ingredients ready and organised for rolling the sushi. Also have a bowl of water to moisten your hands. Lay your sushi roller out flat, then put one of your nori sheets on top with the shiny side facing down. 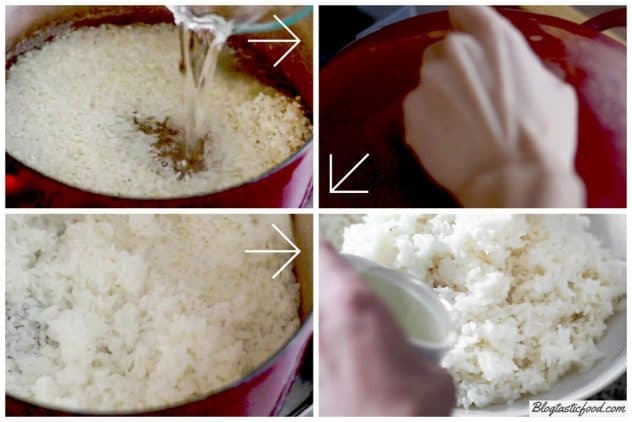 Lightly wet your hands with water so that the rice doesn't stick to them. Pick up some rice and put on the nori, then flatten out the rice neatly and evenly, making sure that you leave about 2 inches of the nori uncovered on the far side. (be-careful to not make the layer of rice too thick). Now put a line of your cucumber, a line of your sliced avocado, a thin line of your cabbage slaw and carrot slaw on the rice. 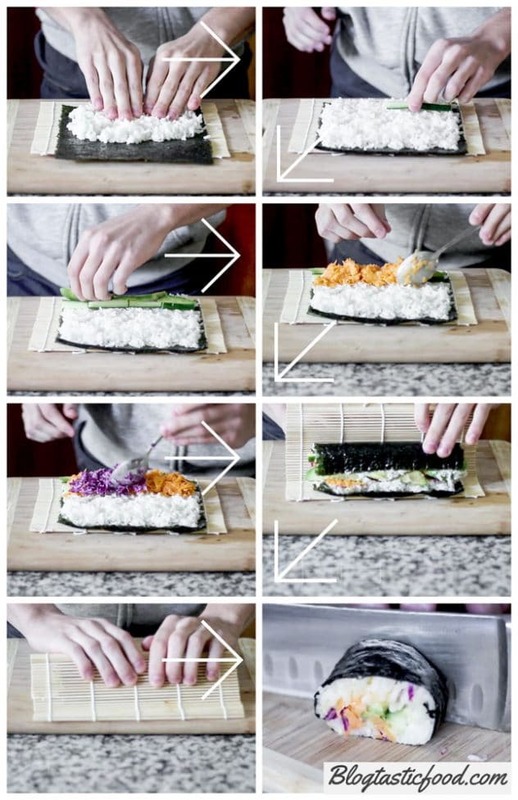 Use the bamboo roller to slowly roll your sushi. Be a bit firm but not too firm. Keep an eye on the sushi to make sure it is being neatly and evenly rolled. (watch the video in the post if you are confused with this step). Once rolled, use a sharp knife to cut your sushi rolls into inch thick slices. Don't push down when you cut, use the length of the knife. Serve with a little ramekin of say sauce and enjoy your veggie sushi rolls. Remember to take your time when rolling, especially if this is your first time making sushi. Make sure you don't overfill the sushi. Avocado and asparagus are my most common veggie rolls. I DO enjoy the raw fish/seafood ones best, tuna, salmon, red snapper etc. But smoked salmon and cream cheese is great to and the California rolls with fake crab legs and avocado. Spicy raw tuna and salmon … SO good. Love the photos and the sushi looks delicious! !